From left: Global Capital chairman Paolo Catalfamo, Prof. Stephen Montefort, the Prime Minister’s wife, Michelle Muscat, Prof. Alex Felice and Global Capital Health Insurance executive director Adriana Zarb Adami. 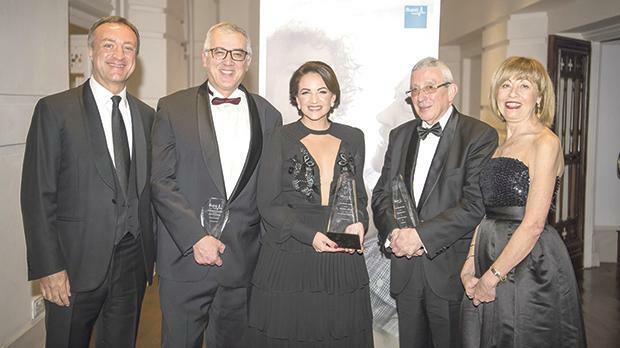 The first Bupa Malta Awards went to two medical consultants and the Prime Minister’s wife for their outstanding contribution in the areas of health research and philanthropy. The awards went to Prof. Alexander Felice for his Outstanding Contribution to Research on Thalassaemia and Rare Disease; Prof. Stephen Montefort for his Outstanding Contribution to Research on Asthma; and Michelle Muscat, the Prime Minister’s wife, for her Outstanding Contribution to Non-Profit Health Organisations. Organised by Global Capital Health Insurance, the awards are intended to celebrate the work of those who have contributed to health research, health improvement and health charities. They were presented during a gala dinner held at the Phoenicia Malta and attended by Prime Minister Joseph Muscat. Prof. Felice, a leading expert in thalassaemia, a genetic disorder that affects the production of haemoglobin, led the establishment of thalassaemia and molecular genetics services in Malta and the development of a Molecular Biotechnology Research Programme, including human and medical genomics, as well as the Malta BioBank. Stressing the “critical need” for Malta to have a well-funded and well-organised national research endowment for the long-term sustainability of health and other research, Prof. Felice urged the Prime Minister to remember that “today’s research is tomorrow’s high-quality jobs”. Prof. Felice welcomed the organisation of these awards as they served to inspire students and young researchers to enter the world of science, while exposing the public to the joy and excitement of scientific discovery. Prof. Montefort, a renowned respiratory physician with a focus on asthma, also welcomed the organisation of the Bupa Malta Awards as they recognised those working to improve the management and treatment of disease through valid research. The lead consultant respiratory physician at Mater Dei Hospital, Prof. Montefort has been Department of Medicine head and Medical School deputy dean since 2012. For the last four years, he has been the Federation Lead for Malta for the Royal Colleges of Physicians UK. “This is a very good initiative as it serves to encourage seasoned veterans like me to pursue further research and recruit some of our promising trainees into the field, just like our predecessors did to us,” Prof. Montefort said. Mrs Muscat, who works tirelessly to help non-profit health organisations and is co-founder of The Marigold Foundation, welcomed the award which she said was testament to the work being done by the whole team of professionals and volunteers at The Marigold Foundation. Mrs Muscat plays a major role in driving change by supporting cancer and mental health organisations, and through the positions she holds on the Association of Parents of Children with Autism; Special Olympics Malta; and the National Alliance for the Rare Diseases Support – Malta. “This award is an incentive to work harder in our core areas of competence: from rare disease awareness to sport access for persons with disabilities, from cancer support to mental health advocacy… and a lot more,” she said.